Mature Height 30 - 80 ft. Mature Width 12 - 20 ft. 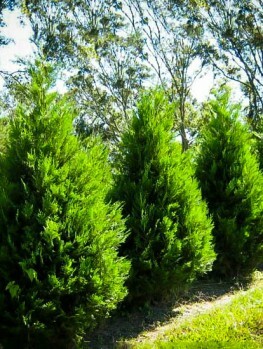 The Murray Leyland Cypress is a breakthrough form of the immensely popular Leyland Cypress. It is even faster growing, capable of adding 4 feet a year when young. It is also much more resistant to the problems that can affect the regular form when grown in very hot and humid areas, like the south-eastern states It will grow in both wetter and drier conditions than the original form, and it will be free of diseases and normally free of any significant pests. It has a sturdier branch structure, and an improved root system, making it more resistant to storms and high winds. 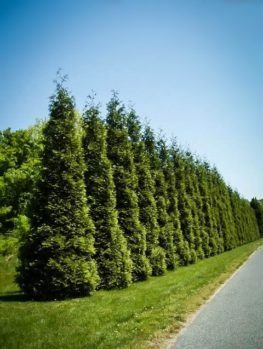 Wherever you want a fast-growing hedge or screen for a larger property, the Leyland Cypress is the number one pick. Now, with the new Murray variety, it can also be the number one pick in areas where previously there might have been problems. 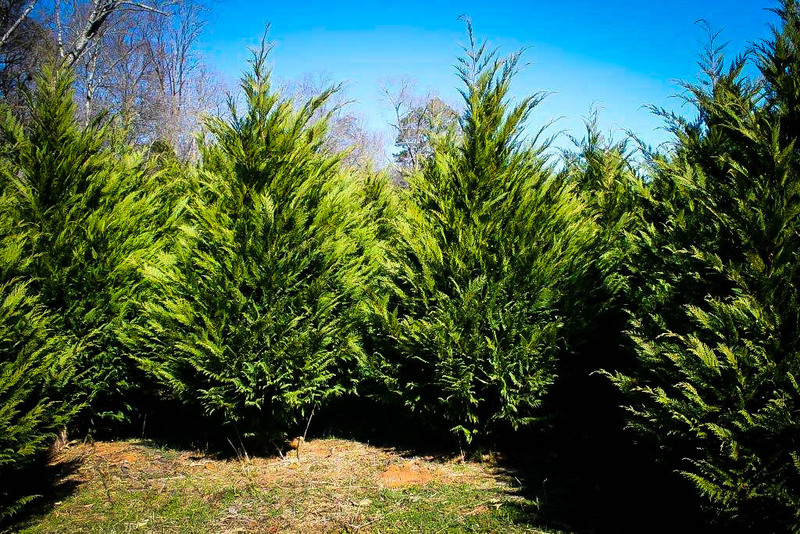 The Murray Leyland Cypress grows best in full sun or partial shade. It can be planted in any kind of soil, and it will still thrive. 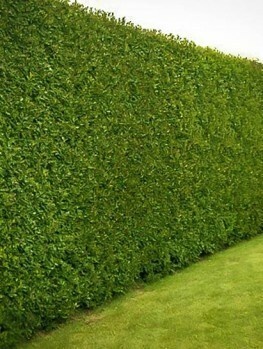 For a hedge, space the plants 3 feet apart in a row and begin to clip as soon as the plants begin to grow. Do not wait until the plants are the full height you want for your hedge. Instead, clip lightly and regularly as they grow, to build up a strong, dense structure. For an informal screen, space the plants between 4 and 8 feet apart. This plant is resistant to salt-spray too, and it can be grown in coastal areas. The Leyland Cypress took the country by storm when it was first introduced. 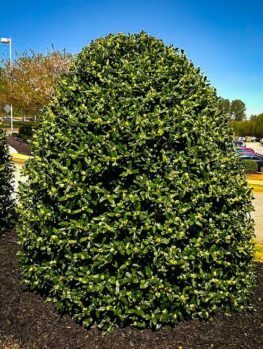 With a growth rate of 3 feet a year or even more, dense foliage, good height and the ability to thrive in a wide variety of locations, it is the number one choice for evergreen hedges. Over time, though, it became clear that in some parts of the country plants can develop problems. Particularly in the south-east, where summers are very hot and humid, some plants began to develop diseases. These were partly due to the growing conditions, often places where the soil was too wet, but not always. Sometimes this was due to a general limitation in the ability of the plant to grow in very hot and very humid conditions – which are often experienced in south-eastern states. Across most of the country this plant stands head and shoulders above the competition – literally – but for the south-east an alternative is needed, a plant that is more durable and reliable. Well now that plant has arrived – the Murray Leyland Cypress. 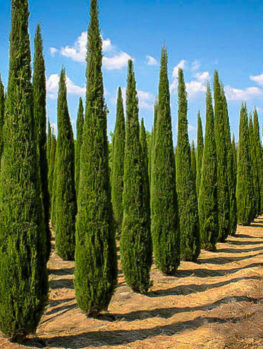 From the chance find of an unusual plant, a solution has been found, with a Leyland Cypress that is resistant to heat and humidity and that will not suffer from the problems seen on plants in those areas. If you live in the south-east, and are looking for fast-growing screening or hedging plants, you may have been uncertain what to plant. Be uncertain no longer. The Murray Leyland Cypress is the answer. Just as fast growing as the original, but disease-resistant and able to thrive in conditions that could have been a challenge, this plant is going to make superb hedges and screens a reality in areas where they would have been difficult. 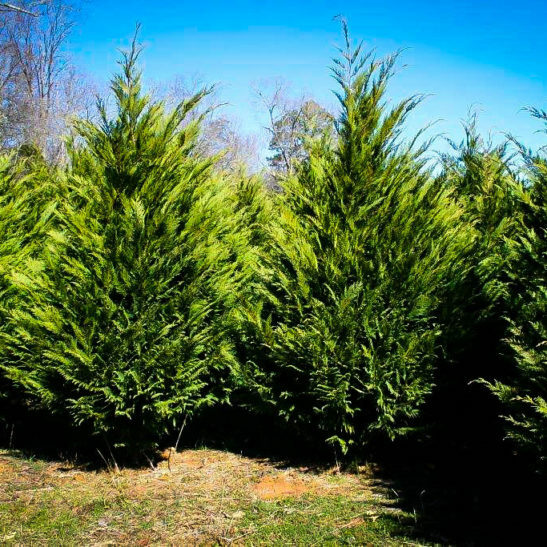 The Murray Leyland Cypress is a special selection of the traditional Leyland Cypress, which grows as fast or faster than the original. It will rapidly become a tall tree 30 feet tall or more, with a full, columnar shape and a width of more than 12 feet. It differs a little from the original tree in shape, because the branches are stronger and thrust outwards a little more, giving the plant more character and interest if grown as an un-clipped specimen tree. This feature also means the plants will grow together faster when planted as a screen, and allows for slightly wider spacing. It has the same foliage, with pointed leaves clinging to the stems and growing in soft upright sprays. In spring it is an attractive lighter-green color, which darkens to a very rich, dark green in late summer and stays that way all winter. Your screen or hedge will always look lush, richly colorful and green, no matter what time of year it is – no more brown winter hedges. 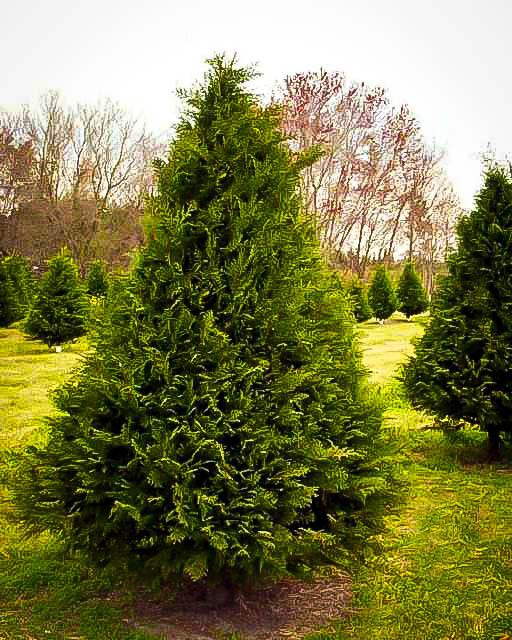 Because of its tougher character, the Murray Leyland Cypress can be planted in almost any location. In fact, this plant is a great choice almost anywhere, not just in the limited area of the south-east, since its sturdy structure makes it more resistant to snow and ice, as well as being better in hot, dry periods. Although the normal Leyland Cypress is reliable almost everywhere, the new Murray variety is also an excellent choice, no matter where you live. 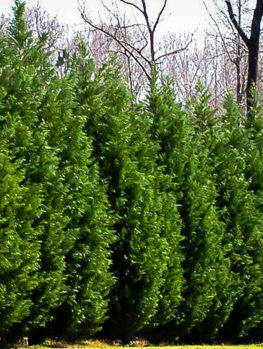 In cooler regions we recommend Thuja Green Giant, or in very cold areas, the cold-resistant Emerald Green Arborvitae. The Leyland Cypress is a hybrid tree that grew from a natural cross between Monterey Cypress (Cupressus macrocarpa) and Nootka Cypress (Cupressus nootkatensis). It originated in a garden in Wales, in 1888. After a long period where it was little-known, it was adopted as the number one, fastest-growing hedging plant around. In southern states it is also grown as a Christmas tree, and it is especially popular in Georgia. Bill Murray is a retired forester who has a Christmas tree farm, and one day he spotted an unusual plant among his Leyland Cypress trees. He took cuttings from it, grew the plants, and planted them to see how they would develop. He was amazed at the growth-rate – even faster than the ordinary Leyland Cypress, as well as by the toughness of this plant both in wetter and drier conditions. He also saw that it was disease-resistant, and so a great improvement for the south-east. An alternative belief of some experts is that this is a different hybrid plant altogether, a cross between the Nootka Cypress and the very tough and heat-resistant Mexican Cypress (Cupressus lusitanica). This cross has been made several times, but particularly in New Zealand in 1961. It is possible that one of these plants was accidentally mixed with some Leyland Cypress that found their way to Bill Murray’s nursery. This cross is called Cupressus x ovensii, and the presence of the Mexican Cypress in it would certainly explain its vigor and resistance. Genetic tests have not yet been done to settle this question. Whatever its origins, gardeners just know that this ‘second-generation’ Leyland Cypress is the answer when you need a screen or hedge in a location or climate where the traditional form will perhaps not do well. We have a good supply of this plant, but we know how big the demand is going to be. 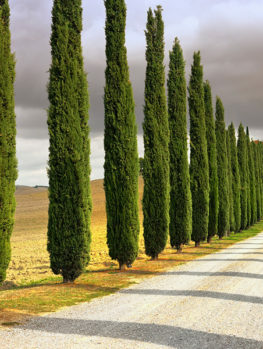 If you want to plant a truly reliable hedge, especially in the south-eastern states, choose the Murray Leyland Cypress. But act fast, as our stocks will not last long.